RWANDA—Diane Rwigara has upped her political activism with the launch of a political movement in Rwanda. 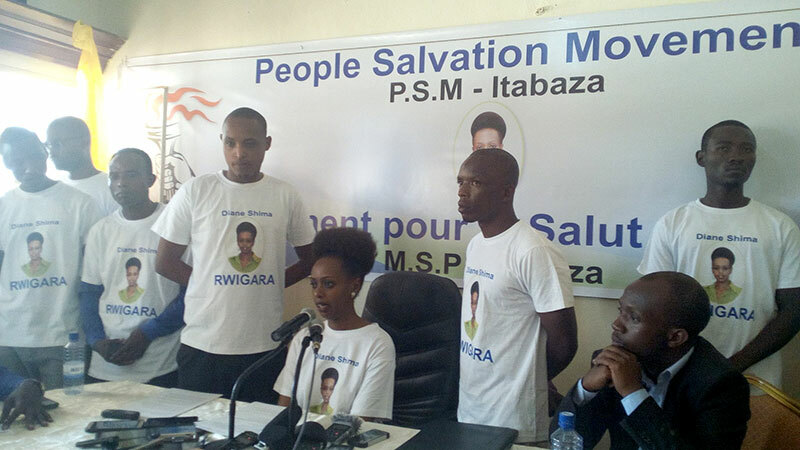 Rwigara whose bid to challenge President Kagame in the August presidential election was thrown out by the country’s electoral commission last week on Friday launched the People’s Salvation Movement (PSM) that she says will sensitise Rwandans about their rights. The launch of PSM-Itabaza (light) comes on the same day the three presidential candidates hit the campaign trails. Incumbent President Kagame launched his campaign in the southern district of Ruhango and is expected in Nyanza District for his second rally later in the day. By 5.30am, many city residents had lined up on the roadside to wait on Kagame’s entourage. Frank Habineza, of Democratic Green Party of Rwanda, who is considered Kagame’s strongest challenger, albeit one who might need more than gods to win even 5 percent of the votes, launched his campaign in Rusizi District in western Rwanda, while Philippe Mpayimana, an independent, chose Bugesera District in eastern swathes of the central African nation for his opening rally. Rwigara said PSM-Itabaza (light) will champion socio-political enlightenment among Rwandans, but only as a movement in the interim since she is yet to register it as a political party. With the PSM movement, Rwigara appears to be starting early preps in her political journey having lost her dream of running for the presidency after failing to fulfil some of the many requirements the Rwandan electoral code demands of presidential aspirants who are not endorsed by registered political parties. The 35-year-old daughter of tycoon Assinapol Rwigara—who was killed in a road accident in February 2015—has been known to not mince her words on governance issues in Rwanda whenever she happened to grant an interview to foreign media, often stressing that she would champion justice in her native if given opportunity to lead. She said Rwandans should feel free to criticise any government policies they do not agree with. Once PSM is registered as a party, it will open the ground for Rwigara—if she becomes its leader—to challenge the presidency as a party flag bearer seven years from now. Rwigara’s first public appearance since the electoral commission rejected her bid last week appears to have poured cold water on earlier reports that she was under house arrest. She told journalists at the media briefing that she was a free woman. Meanwhile Rwigara, who was last week accused by the electoral commission of submitting signatures of at least two voters who are long deceased, has threats of legal suit hanging on her head. Opposition party Social Party-Imberakuri last week said it was taking her to court for filing names of its members without their consent. PS-Imberakuri leader Christine Mukabunani said Rwigara submitted names of 34 people who are registered as PS-Imberakuri members. The opposition party did is not taking part in the presidential election as it could not field any candidate and is yet to openly back any of the three either. “Rwigara stole a list of our founding members and they are now asking us how she got the list. We are organising a congress after which we will sue her,” Mukabunani told the media.